Sometimes we need to convert one data type to another data type to map columns in sql server. You might not be allowed to change table structure directly. In this case you’ve to convert in your query or stored procedure. Suppose you’ve to convert money data-type to decimal for greater precision in calculation then you can do it easily using Cast or Convert methods. Suppose you don’t know which column is money type and have to convert all money type to decimal for a table then you can do it with dynamic SQL. 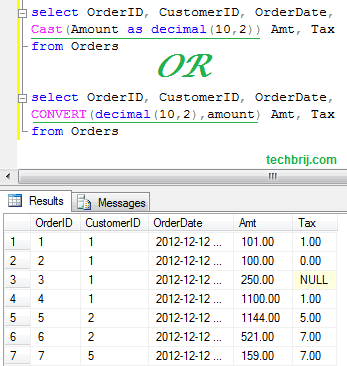 In above SQL, Column name is retrieved from information schema, Cast syntax is used for money data type columns and stored in @sql variable which is a part of dynamic select query.